Caesium-137 is reported to be the major health concern in Fukushima. The government is under pressure to clean up radioactivity from Fukushima from as much land as possible so that some of the 110,000 people can return. A number of techniques are being considered that will be able to strip out 80% to 95% of the caesium from contaminated soil and other materials efficiently and without destroying the organic material in the soil. These include hydrothermal blasting. 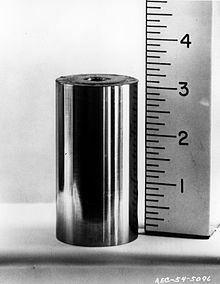 The caesium precipitated with ferric ferricyanide (Prussian blue) would be the only waste requiring special burial sites. The aim is to get annual exposure from the contaminated environment down to 1 millisievert (mSv) above background. The most contaminated area where radiation doses are greater than 50 mSv/year must remain off limits, but some areas that are currently less than 5 mSv/year may be decontaminated, allowing 22,000 residents to return. ^ a b National Institute of Standards and Technology (2009-09-06). "Radionuclide Half-Life Measurements". Retrieved 7 November 2011. This page was last edited on 20 March 2019, at 19:35 (UTC).